Our latest example of the amazing work being done by Scotland’s corporate parents comes from Strathclyde University in Glasgow. 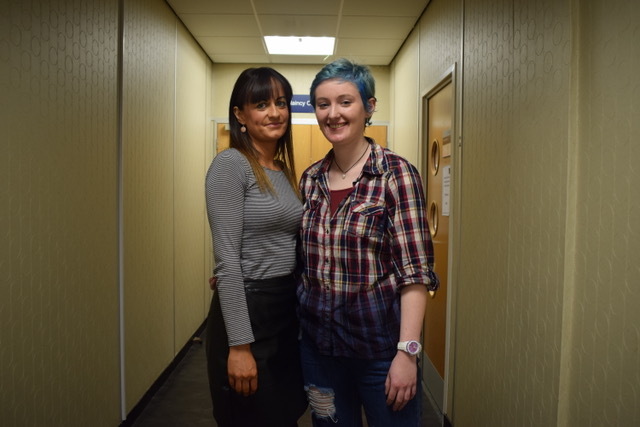 Their established mentorship programme is currently in its second year, and was set up to improve the line of communication between care experienced students and support services. Each student who declares themselves as care experienced is now assigned a member of staff as a mentor in their first year. All grades of staff fill mentor roles, from administrators with experience in professional services, to security guards or heads of department. These mentors then also act as care experience champions within their departments, pushing positive agendas for the care experienced population. The Widening Access team hope that the support of the mentor programme will encourage self-declaration and promote positive attitudes towards care identity. Louise Martin is the Widening Access Support Officer at the university and was a driving force behind the initial build of the programme. Jennifer Lynch is a care experienced student in her second year studying chemistry who feels that the programme has been of real benefit to her, and hopes it will continue for other care experienced students. I think that’s the ultimate test of any kind of project like this, that both participants want to keep it going as long as possible. And yeah, I just think it’s really important to have that extra support when you’re coming to uni from a care background because even if you have a good relationship with your former carers etc it can be difficult to go to them for that support. Whether that be logistically, in that you haven’t got quite that level of comfort in your relationship with them, or in the case of social work, you need to limit that support. Who Cares? Scotland sat down with both Louise and Jennifer to discuss the programme, from its inception to its success with students like Jennifer. Louise: Initially we sent an all staff email out to say would anyone like to volunteer for this? It was just a kind of nice idea at the time, we even thought at the time, if no one has the time, we can just do it ourselves amongst the team, you know, it wouldn’t be that much. Then we got about three hundred emails interest, so it turned into this massive project for me which was brilliant! Jennifer: This wee idea became a monster! L: It turned into a massive thing and I was doing information sessions for a hundred people at a time, so it was brilliant that the response was so nice and really encouraging. I initially thought I’d meet everyone that’s interested one-to-one, but because of the volume, we had to something on a bigger scale. So we did information sessions about what it would be about, what they would be doing, what we think it should entail, how the relationship should work, covering boundaries and things like that, and then we whittled it down, everyone who came to the information session was asked to apply so we got about 200 that applied, and then we had to whittle it down, because we only had like 20 students or something. J: I was gonna say, there’s not many of us! We’re a minority! J: I guess the thing is once you get to year four or five, if there’s 20 a year, that’s about 100 of us, so you can get a lot more people involved at one time. L: I got a big response from a bunch of staff who were still really keen to do it, and I had loads of emails throughout the year saying ‘Is there any availability? Is this still ongoing?’. Staff were really keen to do it, there was a massive interest in it. We have this Strathclyde Cares Committee that the students sit on, and it was a suggestion from one of the staff in the engineering department. We were talking about individual support, and someone suggested that if students had someone they could come to one-to-one, that if a student was matched up with a member of staff, and if we had staff all over the university, we’d have such a huge resource – amongst even the mentors. So they could say, my student’s struggling with finding their way around the library or knowing X, Y and Z and we would have a mentor that’s actually there. It all just took off really quickly and turned into a massive project. Now we hear a lot more about students, any gaps in support, or things students are concerned about. J: Although the Strathclyde Cares Committee meetings are brilliant, you’re only going to bring something up if it’s like a really big in your face issue, but with the mentorship programme, in my case I’m seeing them once every fortnight, little issues pick up as well, so if it’s a recurring issue you can flag it up a lot easier than at a formal board meeting. L: It’s a hard thing, it’s even hard for us at board meetings. It’s quite daunting to come and say, “I don’t think that this should happen.” So I think with the mentors it’s a good relationship that you can just check in with the mentor, then of course I’m always in touch with the mentors. If there’s a recurring issue or if I hear of something and think ‘Oh, I didn’t realise that was an issue’, like if students are struggling academically in any way. For example, it was a bit of a grey area around voluntary suspension and academic suspension, and people weren’t sure what the differences were, or people didn’t know what their options were if they wanted to take time out. J: I know even for people that aren’t care experienced, the whole academic suspension, the different types, like even they’re like ‘I don’t know what I’m on’. I got an email from Louise and the widening access team that they were setting up this project at the start of my first year, just checking if I’d want to get involved. I thought “Why not? I’m in first year and I’m not really sure what I’m doing…” and honestly, it’s been brilliant. I can’t do anything but sing its praises. I think the main thing about it is that it’s so casual. Growing up in a social work environment, it’s very much that everything is regulated and monitored and you have to hit criteria whereas this is just down to your discretion, when you want it or need it. It doesn’t necessarily need to be academic despite the fact it’s an academic member of staff that you’ve got the relationship with. It can just be about, you need a rant, or you have a bad day. I think that’s shown in the fact, with my mentor, I’ve continued the relationship this year, and it’s still been as valuable as last year. I think that’s the ultimate test of any kind of project like this, that both participants want to keep it going as long as possible. And yeah, I just think it’s really important to have that extra support when you’re coming to uni from a care background because even if you have a good relationship with your former carers etc it can be difficult to go to them for that support. Whether that be logistically, in that you haven’t got quite that level of comfort in your relationship with them, or in the case of social work, you need to limit that support. You don’t have that pressure of ‘oh no I don’t want to bother them’ because you know that that’s what they’ve volunteered to do, that’s what they’ve come to the Widening Access team to be part of.